Kwami Odoom plays Demi in Inua Ellams’ The Half God of Rainfall at the newly refurbished Kiln Theatre. Presented in a co-production with Fuel and Birmingham Repertory Theatre, The Half God of Rainfall opens on 30 April 2019, with previews from 26 April 2019, and runs until 17 May 2019. You’re appearing in The Half God of Rainfall at The Kiln Theatre, what can you tell us about it? I would say that Half God is a massive epic told by two narrators, about a Nigerian woman and her half God son, that uses West African storytelling traditions to tell a story that spans from Nigeria to Greece to the States via the furthest reaches of space. It’s a far cry from your traditional fourth wall kitchen sink drama and is a LOT of fun. Well, the whole story is told by two narrators in the third person so I actually take on a whole host of different characters, both God and mortal, male and female! So one moment I’m playing a local boy in southern Nigeria playing with his friends and the next I’m playing Hera, the Greek Goddess, in Mount Olympus! But the main character I play is Demi, mixed race half mortal who starts off notorious in his village for being an almost supernatural crybaby (we’re talking waterlogged fields!) and banned from playing basketball because of it. But the powers he draws from his Godfather lend him an amazing ability to play basketball that takes him on an epic journey. How does Demi compare to previous roles you’ve played? I mean, I’ve never played a demigod before so there’s that. 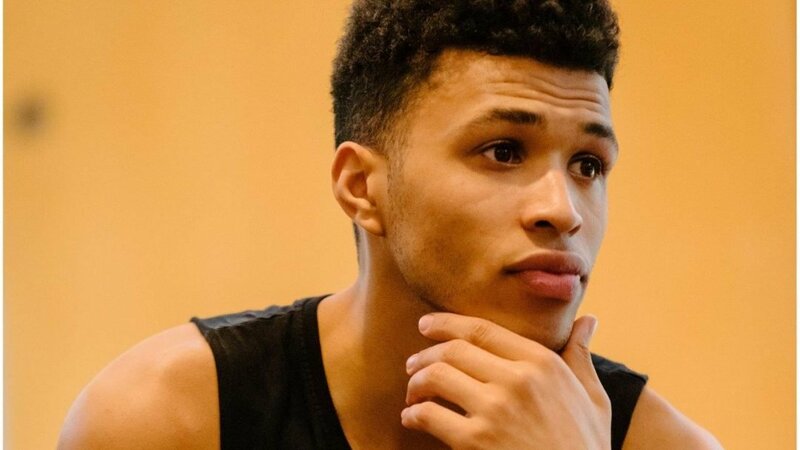 What I find really exciting though is that he’s mixed-race but has grown up in Nigeria and I’m really enjoying the chance to explore that, I’ve only really come across mixed-race characters that have grown up in Europe or the States so it’s really refreshing to play someone who’s fully immersed in Nigerian culture and also to do a West African accent in a play, which I’ve been itching to do for the longest! What has excited you most about Inua Ellams’ writing? I wish he could just walk around and narrate my life to be honest because he could take the most mundane things in your life and make them sound beautiful. What’s great about performing this is that you can really use the words to your advantage when telling the story, every word feels absolutely right and even just the sounds of some words, whether they’re staccato or smooth or short or long, help tell the story. What have you learned from your cast mate during rehearsals? Rakie is just amazing. I’ve never done a play with just two performers in it before and I’ve learnt a lot about how connected you need to be, how much you need to trust your partner and she’s really led by example from day one. It’s been such a joy working with her. What would you say to anyone thinking of coming to see The Half God of Rainfall? Do it, innit. It’s fun, it’s not a story you’ll hear every day (races between Nigerian and Greek gods, hello?!) and it’s really beautiful. Really hope I see you there.